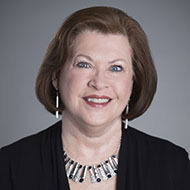 A native Santa Fean, Pat is a graduate of the Western States School of Banking and has over 50 years of banking experience, with extensive focus on private banking clientele. She joined the bank in 2011 and is responsible for providing comprehensive wealth management expertise and exceptional service to clients with distinct banking needs. Over the course of her career she has received numerous awards, including the Santa Fe Professional Business Women Organization’s ‘Woman of the Year’ award in 1991 and the National Multiple Sclerosis ‘Woman on the Move’ Award for her many contributions to service within her community and state. Pat has held many leadership positions in the community including Pancakes on the Plaza Sponsorship Chair, Rotary Club District Awards Chair, and Board member of the Blue Demon Foundation and Lensic Performing Arts Business Council. She has also devoted her time to the Santa Fe Professional Business Women as past-President at both the state and local levels. Provide highest possible level of service to all clients and never stop giving back to my community.